Police sniffer dogs who searched for explosives in the aftermath of the 7 July bombings have been honoured. 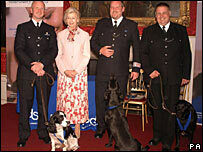 Labradors Vinnie and Billy, and Jake, a spaniel, were awarded the animals' George Cross on behalf of the 14 dogs and their handlers who worked that day. Princess Alexandra, a patron of People's Dispensary for Sick Animals (PDSA) gave the gold medals at a special ceremony at St James's Palace. The dogs were on duty when a car bomb was found at Haymarket, central London. The dogs were deployed to locate possible secondary terrorist devices at the four bomb attack sites on 7 July 2005. They checked access was safe for emergency services, who were preparing to assist those left trapped or injured. Earlier praising their contribution Metropolitan Police Assistant Commissioner Tarique Ghaffur, said: "I would like to pay tribute to all those who were involved in the rescue effort that day who behaved calmly and courageously, including the handlers and their dogs." Freddie Bircher, chairman of PDSA, said: "They worked fearlessly and in perfect unison searching for possible secondary devices. "These police explosive search dogs have been the unsung heroes of that tragic day and now it's their turn for the spotlight." British Transport Police dog Vinnie was deployed at Russell Square Tube site where he searched the tunnel to King's Cross. His handler Pc Dave Coleman said: "Despite horrific conditions, Vinnie never wavered. I was so proud of him." Metropolitan Police dog Jake, whose formal name is Hubble Keck, searched the wreckage of the suicide bombed double decker bus at Tavistock Square. His handler Pc Bob Crawford said: "The initial concern was for the injured passengers still on the bus... we suspected there was a secondary device in a box on the luggage rack." City of London Police dog Billy searching the tunnel in Aldgate in poor visibility and oppressive heat and attended 21 locations throughout the day in response to security alerts. His handler Pc Rob Brydon-Brown said: "Billy is a good lad... every working day I put my trust in Billy and he has never let me down." The PDSA gold medal is generally awarded to animals who are "instrumental in saving human or animal life".